As a budding digital artist, there is a level of uncertainty as to whether or not other people think your work is worthy enough for exhibit. Entering into photo and art contests is not something I regularly do. There are many photographers that do and are quite successful with it. For the past two years, I’ve entered images into the Maryland State Fair and the Howard County State Fair with some success with my entries. Some other contests I’ve entered turned into popularity contests where I had the enlist the help of teenagers and their techie fingertips for votes to get a winning image. Others have been entirely subjective to one judge that has a different perspective of seeing the world ~ and there is nothing wrong with that. Many of these photo contests involve you paying an entry fee which can quickly drain the pocket. One evening we received a phone call on our unlisted phone number with someone who was looking for Mitchell Gallery and wanted information on an upcoming juried art show. After telling her that although we are the Mitchell family, we had nothing to do with the Mitchell gallery, I hung up and the wheels started turning. What is this art show and perhaps I can enter! Looking up the art show and submission information, it didn’t take long for me to submit three digital art renditions of several of my favorite images. One of them being “Luke” the Black-maned lion at the National Zoo. Each of the submissions were images I had printed on canvas prints and had them in stock for who knows when or who knows what. So taking a deep breath, I took the plunge and sent the entries on their way with the hopes that one would be accepted. 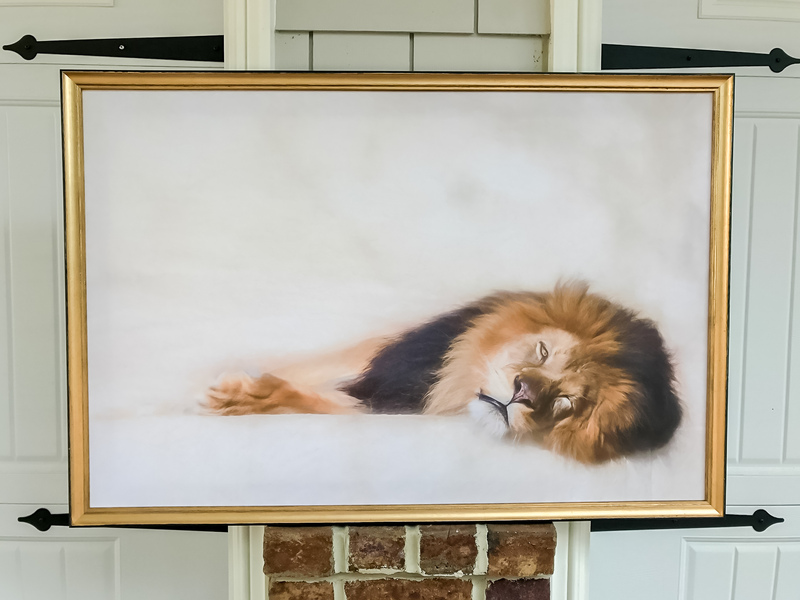 I am honored to announce that “Softly Sleeping” was accepted for inclusion in this year’s Image & Imagination: Anne Arundel County Juried Exhibition. This exhibit is being held at The Elizabeth Myers Mitchell Gallery at St. Johns College in Mellon Hall. 60 College Avenue, Annapolis, Maryland from Tuesday, May 23, 2017 through Sunday, June 11, 2017. The hours of the gallery are: Open noon to 5 p.m., Tuesday through Sunday, and from 6:45 to 7:45 p.m. Friday; closed on Monday. There is an Artist Reception on Tuesday evening, May 23, 2017 from 5:00 p.m. to 7:00 p.m.
And so you see, you never know! Like the turtle, there are times we just have to stick our neck out and see what happens. Great things may be your way. If you are local, it would be wonderful to have you stop by and say hello to Luke and I. We will be thrilled to see you. Good luck Emily, you do beautiful work and you are an amazing artist. You are so very kind Jack. Thank you very much. I agree with Jack. You should have the greatest confidence in your work. I was enamored the first time I clicked on your page. I’m so proud for you! Prayers for your success! Thank you so much for such a warming comment Phyllis. I appreciate your supportive words and thank you. Congratulations, Emily. I knew your hard work and perseverence would pay off some day. This is a very worthy and beautiful piece of photography and I just know it will do well. I wish you every success. Just think Fatima…you can say that “You knew me when…” LOL ! Truly, all of the support and feedback I’ve received on this blog over the years has helped guide me to where I am today. You deserve every success you get because you put in the time, the travel and the hard work! LOL ! You can say that again Sister! Congratulations Emily! This is a stunning piece of art! Thank you very much for your wonderful comment Tiny. Congratulations! What a wonderful turn events. Beautiful image! Hello my dear Perpetua! You’ve actually been on my mind lately. I can’t wait to see where he is placed when I go for the opening night. Of course..a pic will be needed. Thank you so much and love your comment. That is so exciting. Today the Elizabeth Myers Mitchell gallery, tomorrow the Smithsonian in Washington, DC. I love your photo, story and the great progress since we’ve meet in virtual world. Enjoy!. Thank you so much and I am so sorry for responding to your comment. Waaaay behind on my blog. No worries! You have to live your life…I get it!